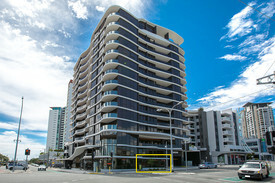 650 Commercial Real Estate and Properties in Gold Coast are listed in 9 categories. We have 438 Offices for Sale & Lease , 373 Industrial Warehouses for Sale & Lease , 343 Retail Shops for Sale & Lease , 90 Development Lands for Sale & Lease , 58 Showrooms for Sale & Lease and 54 Hotels and Leisure for Sale & Lease . 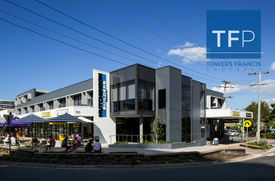 Centrally located at the base of the Chevron Renaissance Resort, this boutique office tenancy offers the perfect entry level opportunity for any start up or evolving business Ground floor tenancy offering direct exposure to Chevron clientele plus exposure to Ferny Avenue Close proximity to 50 Cavill Avenue and 33 Elkhorn Avenue Surfers Paradises' commercial hubs Ideal for newly developed professional services; design, consulting, legal, planning or use as a remote office On site 2 hour client parking available Only $350 per week inclusive of internet and electricity Flexible options available approx. Please contact the listing agent for more details by clicking on the link above. Disclaimer: Ray White has not independently checked any of the information we merely pass on. We make no comment on and give no warranty as to the accuracy of the information contained in this document which does not constitute all or any part of any offer or contract by the recipient. Prospective purchasers / lessees must rely on their own enquiries and should satisfy themselves as to the truth or accuracy of all information given by their own inspections, searches, inquiries, advices or as is otherwise necessary. No duty of care is assumed by Orchid Avenue Realty trading as Ray White Surfers Paradise Commercial divisions toward the recipient with regard to the use of this information and all information given is given without responsibility. 1990m² A grade building, internal lift access, full cafeteria Full fit out in place, air conditioned, ideal for corporate office/headquarters 76 on site parking, easy access to M1 Motorway Contact Teresa to make an appointment to inspect! Approximately Disclaimer: Ray White has not independently checked any of the information we merely pass on. We make no comment on and give no warranty as to the accuracy of the information contained in this document which does not constitute all or any part of any offer or contract by the recipient. Prospective purchasers / lessees must rely on their own enquiries and should satisfy themselves as to the truth or accuracy of all information given by their own inspections, searches, inquiries, advices or as is otherwise necessary. No duty of care is assumed by Orchid Avenue Realty trading as Ray White Surfers Paradise Commercial divisions toward the recipient with regard to the use of this information and all information given is given without responsibility. This incredibly central office is now newly available. Positioned on the highly popular Cavill Avenue and surrounded by cafe and coffee shops, public transport and one block away from the beach, this fully fit out office wont be available for long. 142sqm of Office Space Incredibly Central Location Good Fit out with Reception, Meeting Room and Multiple Offices Great surrounding parking and public transport close by 24 hour access 2 internal lifts Many coffee cafe shops to choose from Available now Approx Disclaimer: Ray White has not independently checked any of the information we merely pass on. We make no comment on and give no warranty as to the accuracy of the information contained in this document which does not constitute all or any part of any offer or contract by the recipient. Prospective purchasers / lessees must rely on their own enquiries and should satisfy themselves as to the truth or accuracy of all information given by their own inspections, searches, inquiries, advices or as is otherwise necessary. No duty of care is assumed by Orchid Avenue Realty trading as Ray White Surfers Paradise Commercial divisions toward the recipient with regard to the use of this information and all information given is given without responsibility. Private Office Away From Home $800 per month + GST (All.. Stunning Waterfront Precinct | Free Street Parking | Great Amenities $665pw | 8 Person Workspa..
PROPERTY OVERVIEW $665pw Price incl. 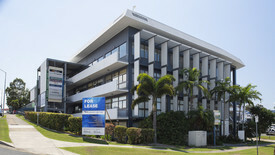 Smart and affordable office space for rent in Nerang with free parking. This office has a variety of coworking desks and private office rooms available in a combination to suit your business. Whether you are an entrepreneur, sole trader or small business, the plug and play office space is perfect for those seeking a quiet and professional workspace in the regional area of Nerang (4211). Internet, full office furniture, electricity, insurance and outgoings are set up and included in the rate along with a chair, mail box key, office key, desk key and bin. Tenants will enjoy shared access to a conference room, neat reception, fully equipped kitchenette, staffroom and printer with free printing privileges for every member, plus complimentary tea and coffee, air conditioning and 24/7 member access. If you work at a desk and require access to the usual office amenities, this affordable workspace in regional Queensland has everything you need. Tours available daily. 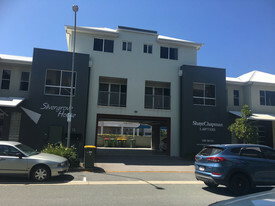 This office is located in the Maid of Sker, an office/retail development in the commercial centre of Nerang. The charming precinct is a single level, U shaped building housing a range of retail shops, local businesses, boutique offices and a welcoming community atmosphere. There are 34 free onsite car parking spaces for staff and visitors, the building is air conditioned and you can place your signage/branding at the entrance. The office is located in the heart of Nerang on the same block as the Shell Garage, Coles Express, NAB and Nerang Community Hall and directly opposite Bischof Pioneer Park where you can work out or take a break in the sun. 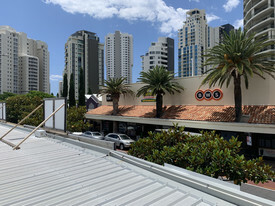 The workspace is also just a short walk from Earle Plaza, the Cineplex and Nerang Fair Shopping Centre. The Pacific Highway is within two minutes’ drive, Nerang Railway Station is a 20 minute walk away and there are several bus links from nearby Price Street. The advertised office space is perfect for a team of 8. If you need more or less space, we have over 30,000 furnished workspaces all over the world suitable for a team of 1 to 200+. Our award winning team offer a free service that will help you find the perfect solution for your needs, so reach out if you need more help. What you get for your weekly rent , 24/7 Access , 24/7 Security , Access to internal breakout areas , Access to kitchen facilities , Access to secure printer and scanner , Building outgoings included , Commercial grade internet , Electricity usage included , Flexible terms , Regular cleaning Building features , Abundance of natural light , Air conditioning , Car parking Street (Free) , Company Branding at reception , Disabled access and facilities , Gym and fitness centre close by , Retail and shopping malls nearby , Taxi / Uber stand close to building Easy access to Pacific Motorway (M1) Directly opposite Bischof Pioneer Park 70m to Nerang Markets 300m to Earle Plaza 1.6km to Nerang Railway Station Who is Office Hub? Office Hub is the world\'s No.1 marketplace for office space. We have a huge global selection of coworking spaces, serviced offices and shared office spaces with flexible options to suit teams from 1 200 people. We\'ll take you on a tour of all the workspaces that fit your needs and work on your behalf to get the best price possible. We\'ll help you discover how shared office space can be the most beneficial and budget friendly solution for your business. www.office hub.com Conditions apply – the advertised price includes any incentives offered based on a 12 month agreement and is available to new tenants only. Please note that the rental rate may increase for a shorter rental period. A portion of the square meterage factors in access to shared space. 40sqm Office - 450m To The Beach $1,000 pcm + Outgoings + ..
90sqm Professional Private Office $2,250 pcm + Outgoings + ..
113m² First floor office Freshly painted Stylish fit out to suit professional firm 2 large balconies overlooking Orchid Avenue Ducted air conditioning Basement parking available at a great rate Approximately Ray White has not independently checked any of the information we merely pass on. We make no comment on and give no warranty as to the accuracy of the information contained in this document which does not constitute all or any part of any offer or contract by the recipient. Prospective purchasers / lessees must rely on their own enquiries and should satisfy themselves as to the truth or accuracy of all information given by their own inspections, searches, inquiries, advices or as is otherwise necessary. No duty of care is assumed by Orchid Avenue Realty trading as Ray White Surfers Paradise Commercial divisions toward the recipient with regard to the use of this information and all information given is given without responsibility. 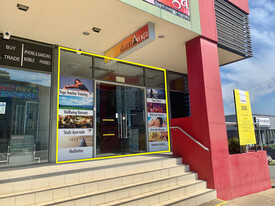 Often sought and rarely found is this prime A grade ground floor office suite in the heart of Coolangatta's CBD main street. This building has recently undergone a complete refurbishment and features prime corporate look finishes, floor to ceiling glass windows and professional lobby entrance that is sure to impress. FEATURES: 67sqm Net lettable area. 1 Secure basement carpark for exclusive use. 100 meters walk to Coolangatta Beach. Ample all day carparking in close proximity. Disabled access. Open plan. Professional fittings with glass entry. Airconditioned PRICE: $2650 PCM + GST (Includes outgoings). First to see, will lease. To arrange inspection contact exclusive managing agents Towers Francis Property.